I searched the archives and didn’t find anything about this, but i was given a box of really cool looking glass jars with corked lids. Can I transfer all my solvents, stains, oils, etc into these and have them be stored safely and where they won’t go rancid? I live in Texas, so its damn hot and rarely gets below freezing. But I’m also curious about them being exposed to light. years and haven’t noticed any evaporation. 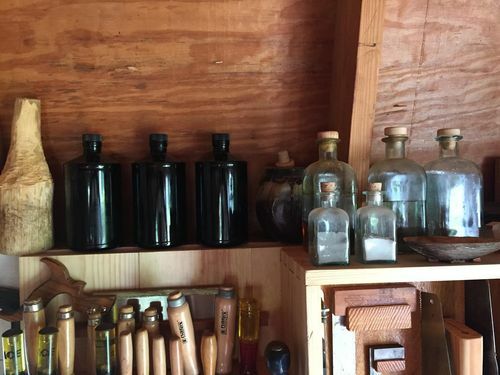 I’ve stored boiled linseed oil, turpentine, mineral spirits, shellac, stains, and denatured alcohol in corked glass containers for years … haven’t had any issues thus far. Not sure about the exposure to light, as my shop tends to be a bit dark. Very cool. And if I remember correctly, Ron, isn’t your shop in GA and gets up to like 120 in there? Sounds like its pretty safe to me. Cork doesn’t seem airtight enough to me. If I decant any finish, or mix dye, it’s usually put in a mason jar. They’re cheap and seal tightly. I also store my shellac cloths in one too and they never dry out, always ready to dip in the 1/2 and 1 lb cuts I keep ready, and wipe. Some things, like lacquer and the shellac cuts, are prone to seal the lid on, making it difficult to unscrew. For them, I buy empty quart paint cans. For oil products, I use Bloxygen when I close the container. Even though the finish might look OK, oxygen will damage the product if you don’t isolate it. ....always ready to dip in the 1/2 and 1 lb cuts I keep ready, and wipe. Some things, like lacquer and the shellac cuts, are prone to seal the lid on….. Please forgive my ignorance, but what are “cuts”? I assume either cut up rags or or different finishes that were “cut” or mixed? Chris, it’s cuts of shellac. A 1 lb cut is one pound of shellac flakes mixed in a gallon of denatured alcohol. A 2 lb cut is two pounds in a gallon, and so on. I’m not sure what the origin of the term is, but that’s what it means. Just for convenience I buy cans of BullsEye Seal Coat shellac. Out of the can it’s a 2 lb cut, which is pretty heavy for general use. I take a pint of it and mix with a pint of denatured alcohol for a 1 lb cut and a cup of it mixed with three cups of alcohol for a 1/2 lb cut. Just so they’re handy when I need them, I pre-mix them and put them in empty quart paint cans from Home Depot. The cloths I mentioned are just cut up cotton t-shirts that I use to wipe on the shellac. By storing them in a mason jar, they never dry out and will be good for years. Not the shellac cloths. Shellac evaporates, it’s oxidation that causes combustion. Even then though, storing oily rags in a sealed container is safe, since it will consume the oxygen and the oxidation ceases. It’s piles of oily rags that will combust because they have a ready supply of oxygen, and the density of the pile maintains heat. With heat comes more rapid oxidation producing even greater heat. That will continue until it gets hot enough to combust. That’s true … and again, no issues to date. I also keep cuts of shellac and tinted boiled linseed oil in plastic (Kroger) whipped honey containers! Very cool. And if I remember correctly, Ron, isn t your shop in GA and gets up to like 120 in there? Sounds like its pretty safe to me. I ve stored boiled linseed oil, turpentine, mineral spirits, shellac, stains, and denatured alcohol in corked glass containers for years … haven t had any issues thus far. Not sure about the exposure to light, as my shop tends to be a bit dark.